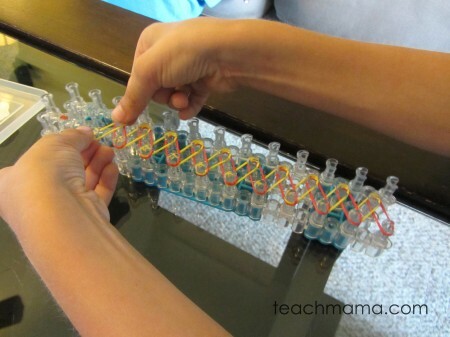 We are loving–and I mean loving–the Rainbow Loom. We’re bracelet-making, ring-wearing, tiny-rubber-band toting fools. And when I say we love the Rainbow Loom, I mean we love it. Like we want to marry it love it. Though I could count more than a dozen reasons why your kids need the Rainbow Loom and why parents love this silly little thing, I know we’re all busy. But more importantly? I know we’ve all got bracelets to make. 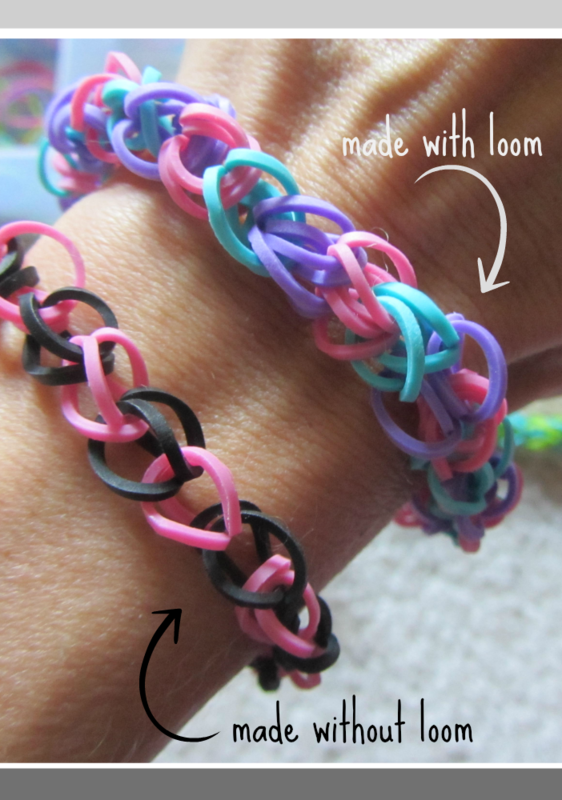 And even if you don’t have THE Rainbow Loom, you can still make Rainbow Loom bracelets without the loom. 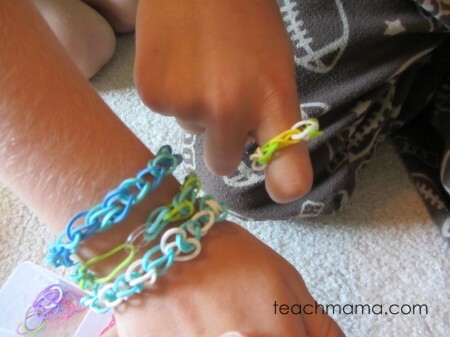 Here’s how: How to Make Rainbow Loom bracelets without the Rainbow Loom. 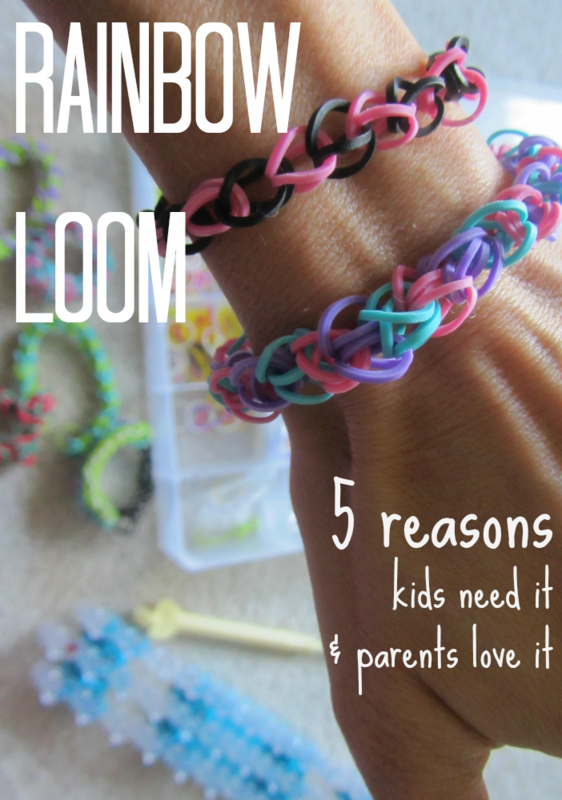 So why do your kids need the Rainbow Loom? Why will you, as a parent, love it? Five reasons. First of all, what is the Rainbow Loom? 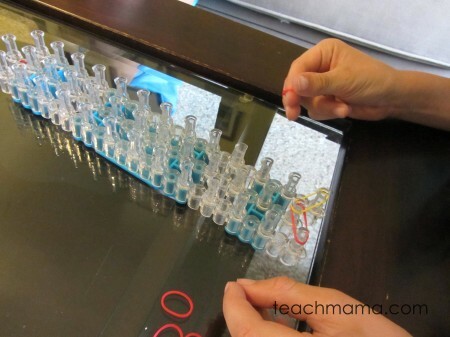 It’s a simple plastic ‘loom’ on which people strategically place tiny rubber bands, connecting them, twisting them, and looping them into bracelets, necklaces, rings–you name it. Secondly, how do you make Rainbow Loom bracelets? There are an insane number of ways to make bracelets without the loom and on the loom, and the RainbowLoom.com site has a boatload of instructional videos. The cool thing is that you don’t necessarily need the Rainbow Loom to make Rainbow Loom bracelets. Cora and Owen don’t use the loom quite yet; they are perfectly content creating ‘Rainbow Loom’ bracelets and rings simply by looping and connecting them by hand. Maddy, on the other hand, loves the loom itself and can really rock it out. 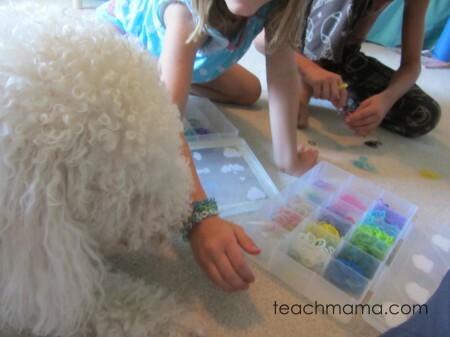 Why do I say kids actually need the Rainbow Loom and parents will love it? Here’s why: 1. 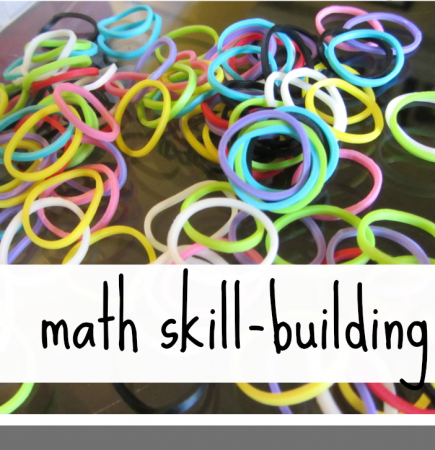 Math Skill-Building. Serious, hands-on math skill-building with each and every bracelet made. We’re talking pattern-making. Two colors, three colors, whatever the number, it doesn’t matter. Kids will begin to pick up on patterns if they haven’t already. Throw a little: Heeeeey! I love this bracelet you made, Cora. The blue-green ABAB pattern is rockin’! And look at Owen’s mix-up of ABBCABBC. 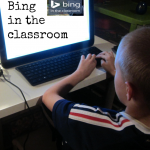 . . into the mix, and your kids will start to see real-life connections to what they’re learning at school. And there’s shape-recognition. My kids lean heavily on the instructional videos on the Rainbow Loom site, so before I knew it, they were talking about making the ‘double rhombus’ or the ‘crossed hexagon’ bracelets. My heart skipped a beat, and I wanted to dance. We haven’t talked shapes like this since way back with our Super Sweet Shape Snacks. Woot. Bring on ‘da math. 2. 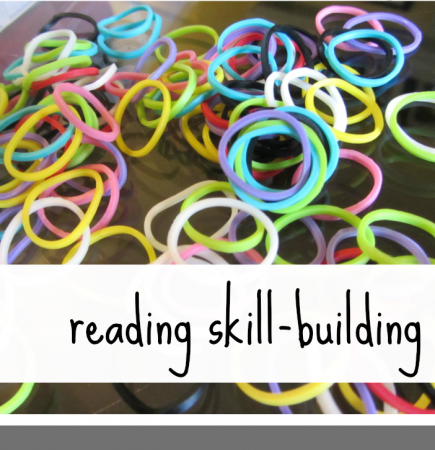 Reading Skill-Building. Reading informational text is not only a component of the Common Core–it’s an integral life skill. Whether it’s recipe-reading, map-reading, newspaper reading, or book reading, kids need to be able to read informational texts. 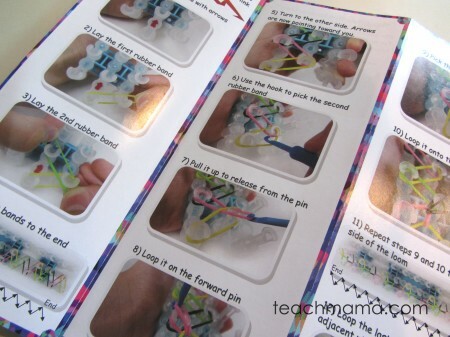 The Rainbow Loom Instruction Manual is a super starting point for kids for doing some serious instructional reading because it’s high-interest, it’s hands-on, and it’s clearly written and formatted. Photos. Step-by-step instructions. Great combo. Kids are reading and re-reading to gain understanding. They’re following steps and managing a task. Seriously. 3. 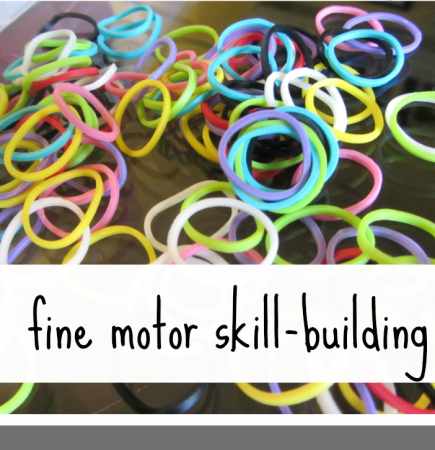 Fine-Motor Skill-Building. 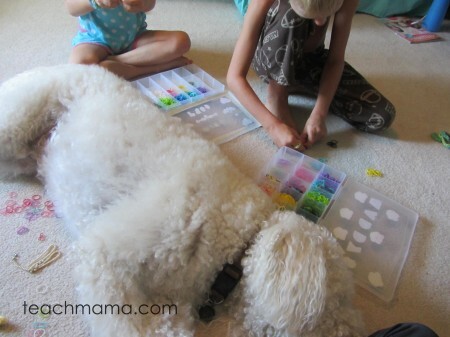 Whether your kids are making Rainbow Loom bracelets without the loom (like Cora and Owen do) or with the loom (like Maddy does), it doesn’t matter. It’s all working those teeny little muscles in arms and hands and fingers that help kiddos with all of those super-important skills like mastering the tripod grip (proper grip on pencil). From the organizing of the bands to attaching, looping, and knotting, it’s all working those fine motor skills. And even those kids for whom doing it by hand is difficult, they can still rock out the little Rainbow Loom tool–it all works. It all counts. 4. Relationship-Building. 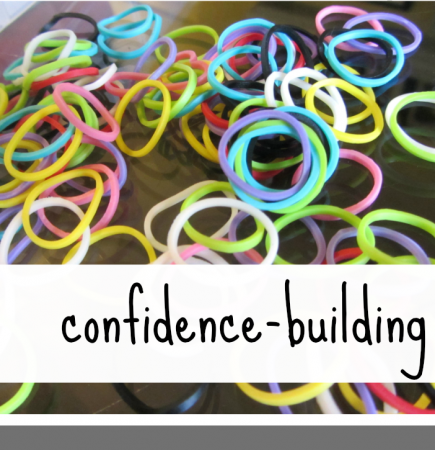 This weekend, the kids were in small groups all over the pool deck making Rainbow Loom bracelets. Hanging out, teaching each other how to do it, chatting, and enjoying time together. My kids have been helping each other make bracelets. They’re forging bonds with each other and with other people in sharing what they know about making these bracelets and in sharing the bracelets themselves. But all over the pool for the last few weeks, kids have been hanging out together, teaching each other how to make different types of bracelets and really–amazing the adults. 5. Confidence-Building. Maddy had to start and re-start eleven times before mastering the ‘Triple Single’ bracelet. Eleven. Times. I have yet to master any of the bracelets other than the basic loop that Owen and Cora use. It’s hard. But manageable. And it takes patience. I overheard Maddy’s girlfriends talking one night last week, and one gal said, It feels so great to be able to start and finish something that looks so good, you know? You just feel so proud of yourself after you finish one of these. And she’s right. It’s like the old friendship bracelets of the ’80’s. But with a 21st century twist. Owen sticks with ring-making, but he loves making them. Cora was on cloud nine yesterday because one of the ‘big boys’ at the pool asked her to make one for him. She didn’t, but she was still flattered. This weekend, kids were in groups all around our pool, teaching each other. Helping each other. It’s awesome. And for our little entrepreneurs, who knows what Rainbow Loom bracelets could lead to? Really. That’s it. This mama digs anything that sneaks a little learning into our every day. And for me, Rainbow Loom is a big win. Five times over. What do you think? Rainbow Loom craze hit your family yet? Ready to get started but don’t have the loom yet? 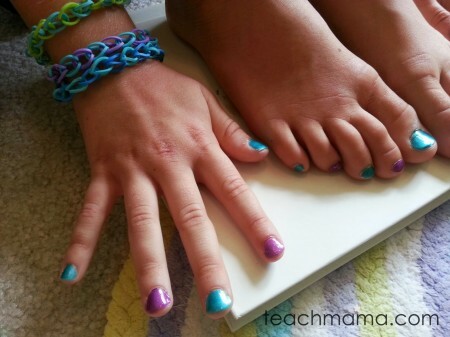 Check out How to Make Rainbow Loom Bracelets Without the Loom! 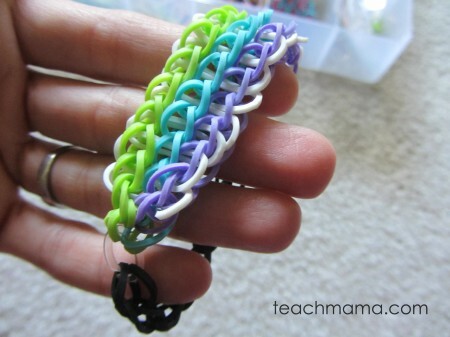 Already loving the Rainbow Loom but want a few cool ideas for bracelet-making? Check out 9 Band Bracelets for Kids to Make from my friends at Kids’ Activities Blog! 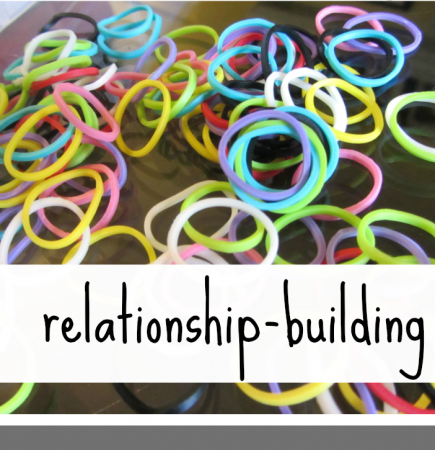 fyi: Affiliate links are used in this post, which means that if you’re into getting your kids set up with Rainbow Loom bracelets and want to use these links, awesome. We get a itsy-bitsy, teeny, tiny cut and every little bit helps! I have a 5 year old son. Could he do this? yes! I think so–especially the basic fishbone or no-loom bracelet! We used to make a sort of jump rope with rubber bands like these, it was more of a hopping rope. Fun! Pinned! really?! a jump rope!? HOW fun. . .Maddy’s made a really, really long one–I never even thought to do a jump rope with it! Heading off to see how many more bands we have to add to it in order to get the heartbeat going! I have never heard of these! Either the ages of my kids (oldest is 1st grade) or the craze hasn’t reached South Carolina yet. 🙂 But this post definitely made me nostalgic to weaving potholders in elementary school and making friendship bracelets as middle schoolers. So fun! We spent many Saturday mornings attempting to sell our wares at little lemonade-esque stands… relatively unsuccessful earning-wise, but oh-so-full of memories! I’d never heard of this but after reading your post I am SOLD. My kids will love this. Thanks, Amy! Colleen! DO IT! And let me know what you (and your kids) think! So fun. So addicting. So very fun. Amy, I ordered the Rainbow Loom and it arrived this weekend. My 8yo daughter just made her first bracelet and gave it to me. Swooning now! 😉 Thanks for tipping me off to this wonderful activity for her. YAY!!! Colleen! SO so so happy to hear that~! Hopefully your daughter will stick with it, despite the inevitable frustration she’ll feel when she’s learning a new pattern! For my kids, it’s been a good lesson in determination! 🙂 Thanks for sharing, my friend!! My 7 year old son came home wanting one of these the other day. He had a gazillion bracelets from other people, but he wanted to make his own. The next day he came home from school with an order form with orders from all of his friends. It is great for him because it takes patience and he loves that he has a finished product in the end. Even the teachers are wearing them at school. Kim–SO fun. I totally agree. I’m right there with the best of ’em, making my own bracelets, sharing them, and trying to learn new bracelet techniques! I am ten years old and I just ordered the rainbow loom. I can not wait to make the zig zag, triple single, single, and your post just made me want to do it more! Thanks! My daughters are 3 and 5. I know the loom says 8+ but I am hoping that this would be a good quiet time activity. I know they have directions for very simply designs. I am going to have to try this out for myself first. Nicol–Do it! Let me know what you think. There are some little ones– about 5–who are able to use it! Good luck! I personally LOVE making rainbow loom bracelets. (I’m in 7 the grade) it first started with gong to a friends house and we made some (I fell in love with these instantly!) I had to get one so I did. I got to the advanced level in a couple hours. Then expert in a couple more. Now I’m inventing my own! There so addicting! There fun and amazing. I would recommend this fully 100 %. Hi!!! I am 10 and have every loom crazy loom rainbow loom and fun loom!!!!! Me and my baby sister (4 years old) make loom bracelets and yesterday my 4 year old sis made starburst!!!!!!! OoO omg I was so suprised !!!!!!!!!! P.S.I am learning new tequniques and I am pretty sure that teachers will come to their senses and bring them back!!! So far, I’ve done more looking at ideas than actually creating much (which is my way), but I am exited to be part of this whole craze. Nicola! Yay! You will LOVE it! It’s addicting and fun for the whole family! Please be sure to share some pictures once you make your bracelets!! Literally just hit my family. I’m 14 and enjoy Rainbow Loom (without loom as of now… hoping to buy one with next pay from job that I’m about to mention)! My mom and I babysit a 6 year old girl who taught me a simple one: Twist the first band into an 8, put one loop on your index finger, the other loop on your middle finger. Now for the rest, don’t twist them! Simply place one just a bit above the previous band, and pull the lower one’s ends over the fingers. Keep doing this until you have one long enough to make a bracelet. Then, grab an S-clip or C-clip and clip the rubber band ends in. I later taught my mom how to make these bracelets, and she made one for the upcoming St. Patrick’s Day! These are loads of fun. Even for teens! ROYCE!! I literally JUST learned this way earlier this week!! SO crazy cool, right? Love it! Many thanks for sharing, and best of luck with your babysitting! She sounds like a lucky girl to have both you and your mom to hang out with!! YAY!!! Happy, happy, HAPPY DAY! I bought the Rainbow Loom for my daughters aged 9 & 11. I got into it to and love the more complicated designs. I have also bought us all the Monster Tail which is also just as addictive. We are going through hundreds of bands a week and always buying refils for our boxes. My kids have also got there friends addicted to it to from as young as 5 are doing them on there own. there in the garden surrounded by their storage tubs just making alsorts. Best thing i’ve bought. I’m an adult, and I bought the ‘monster tail’ a couple months ago just to see what the craze was about. I was quickly hooked, even though I’m not a kid. I have fun trying the more complicated designs. I gave away a bunch to family and friends, and I teach the simpler designs like the fishtail to anyone who is interested. An Aussie friend of mine has regular gigs with his band, and he makes up a bunch before gigs to throw into the audience since he likes the colors he can gets the loops in! Melany! 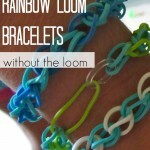 SO fun–I love that you have given a bunch away–that will only continue the rainbow loom craze!! I am 10 years old I just made a turtle and a pikachu (pencil bangle) with help from tutorialsbyA and Elegant Fashion 360… I have made an array of bracelets including the hibiscus, starburst, single chain, double rohombus and much, much more!